Michael Antonio "Vannozzi" was born in Orange County, California August 10th 1958, and was raised in Las Vegas, Nevada. His father is Isidor D. Vannozzi of Trenton, New Jersey and his mother is Mary Norma Messina of New York City, New York. His father's side of the family originated in Monteleone Di Spoletto, Italy. His mother's side of the family originated from Messina and Cane Cati, Sicily. Michael Vannozzi married Peggie Anne Marie Thorn on June 28, 1980. Michael and Peggie have three children: Michael Anthony, Victoria Rose, and Grace Amore. Vannozzi has loved and been involved with art his entire life. His passion for art blossomed when he was 6 years of age, when his parents gave him an Art set as a Christmas gift. He carried his love for art throughout high school, where he became the president of the art club, at Las Vegas High School, and all throughout college at the University of Nevada - Las Vegas. Vannozzi is constantly reading and studying about Art. In early 2014, after reading about and studying the art of Alexander Calder, Jean (Hans) Arp, Henry Moore, and Pablo Picasso, Vannozzi became very interested in Biomorphic and Geometric shapes. This is when he developed the innovative concept of breaking away from the confines of the typical square and rectangular canvases, and making wood panels in virtually any shape he desired. 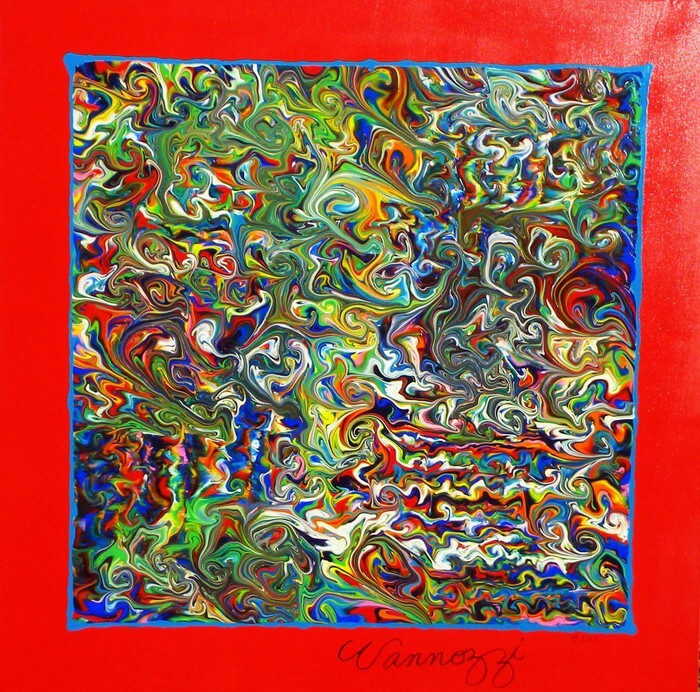 Vannozzi is also a Colorist, and likes bright colorful paintings. 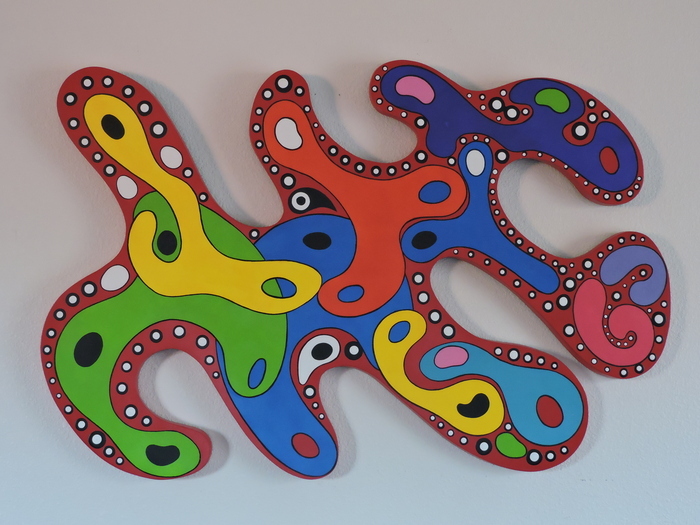 For this reason, he elected to integrate very colorful Biomorphic and Geometric shapes, and Abstract Expressionist designs into his new style of shaped art panels. An Irregular Oval shape that has a linier texture, around the perimeter, which is reminiscent of grey granite, and surrounds a flat black recessed background, that is covered with thousands of drops of flat black paint, giving the background a dappled texture. 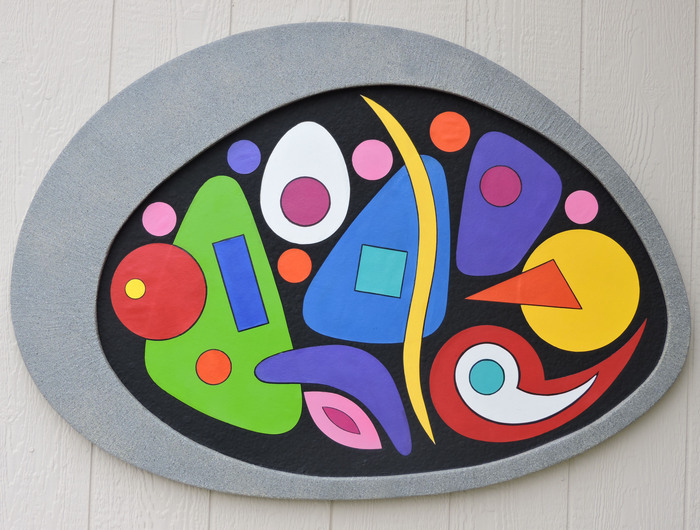 Affixed on top of the flat black background, in the form of a Collage, are various sized “Biomorphic” shapes that are hand painted on heavy paper, in various bright vibrant colors. 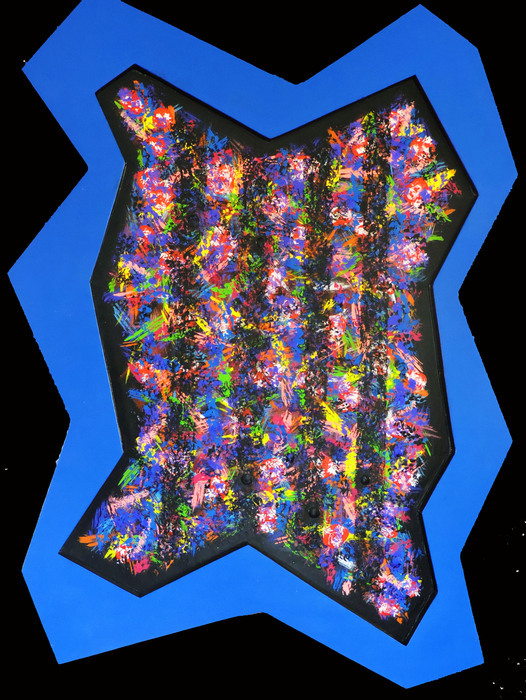 A multicolored Abstract Expressionist painting surrounded by an irregular angular Geometric Abstract perimeter colored in bright blue, and offset in black. The inner part of the painting includes a multitude of various bright colors, executed in a stippled pattern over a black background. Visible are vertical shadow stripes, which are slightly camouflaged within the multicolored background. An irregular curvilinear looping biomorphic shaped artwork, that is painted bright red around its perimeter, and its main body. 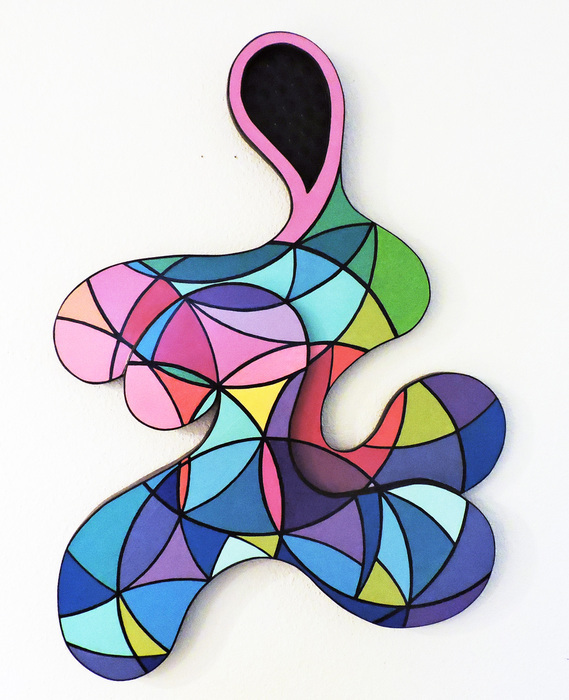 Art Method: Hand Painted Acrylic on Shaped Wood Board and Hand Painted Heavy Paper Collage glued to Shaped Wood Board. 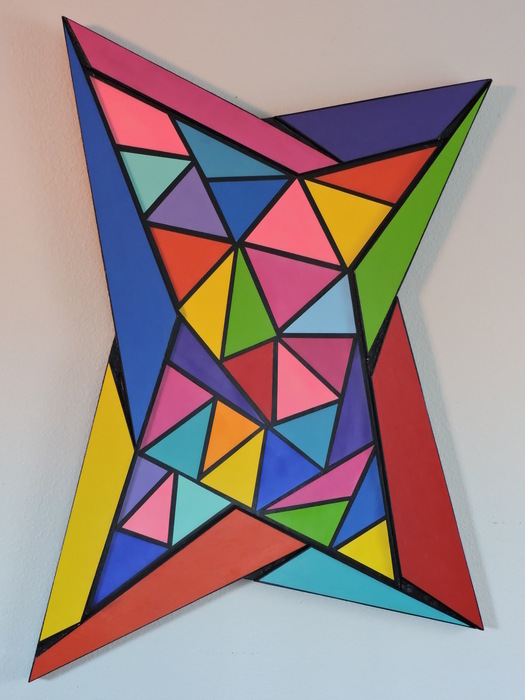 The artwork incorporates multiple bright colored shapes on a black background with recesses cut into the shape itself, giving it a 3 dimensional effect. 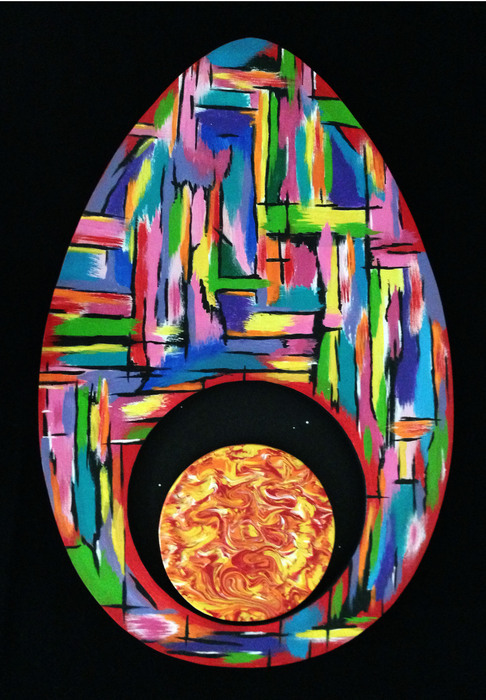 A Biomorphic egg shaped Abstract Expressionist styled artwork that features a bright multicolored main body with black linier accents, and a bright red perimeter. Located in the lower side of the artwork is a circular recessed area, where canvas is subset, and is painted satin black. The round satin black area is stippled with droplets of satin black paint, giving the recessed area texture, and “Swarovski Crystals” are affixed randomly in the round black recessed area to represent “Stars”. Floating above the bottom of the satin black recessed area is a representation of a “SUN” painted with a swirling pattern of bright yellow, bright red, and bright orange. 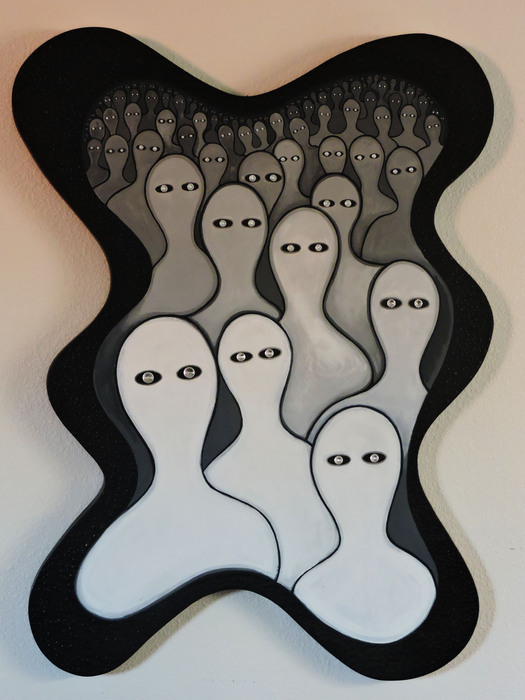 A predominantly Black Curvilinear Biomorphic shaped piece, with a multitude of Biomorphic shaped personages, creating a representation of a huge dimly lit auditorium full of “Souls”, all of whom, are staring back through a porthole at the person who is viewing the artwork. The eyes of each “Soul” utilize Swarovski Crystals that twinkle, and seem to glow, through their refraction of light, intensifying eerie the effect of Eyes looking back at the person viewing the Artwork. The personages are larger at the front of the painting and brighter in tone; gradually reducing in size and increasing in tone of darkness, giving the illusion of great depth, and a large multitude of Souls. The perimeter of the piece employs a stippling effect of black dots of paint creating texture. 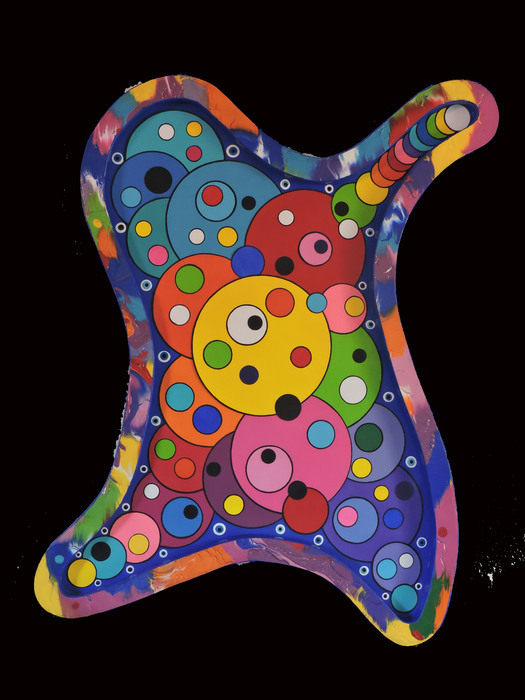 A artwork containing a recessed Trapezium inner shape within a Trapezium outer shape or perimeter, and contained within the recess is a multicolored Biomorphic Abstract Expressionist painting , with multicolored members, and worm like scroll work that resemble microscopic organisms with tentacles, overlying a pink and black background. The area between the outer and inner “Trapezium” is colored in a light purple color, and is offset by a darker purple color on the sides. The front facing lighter purple colored side is accented by a texture of raised Circular protrusions of differing sizes. 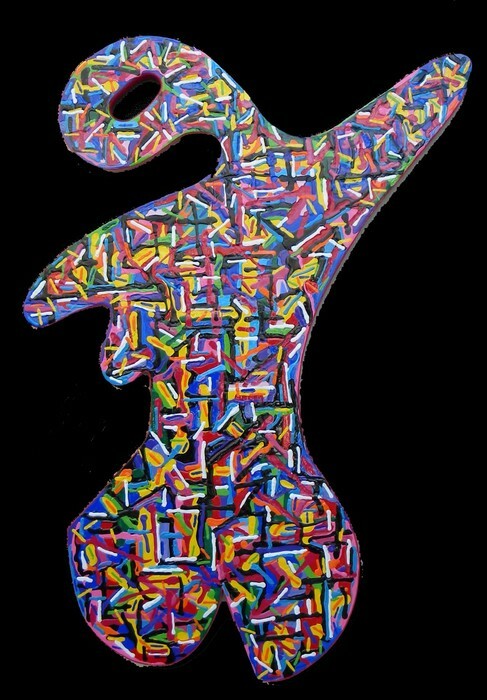 A Biomorphic Abstract Artwork representing a Feminine Figure, having a pink rose colored perimeter and an Abstract Expressionist painting featuring a multitude of colored lines and patterns. Art Method: Hand Painted Paper Collage on Canvas Backing with integral Shaped Wood Frame. 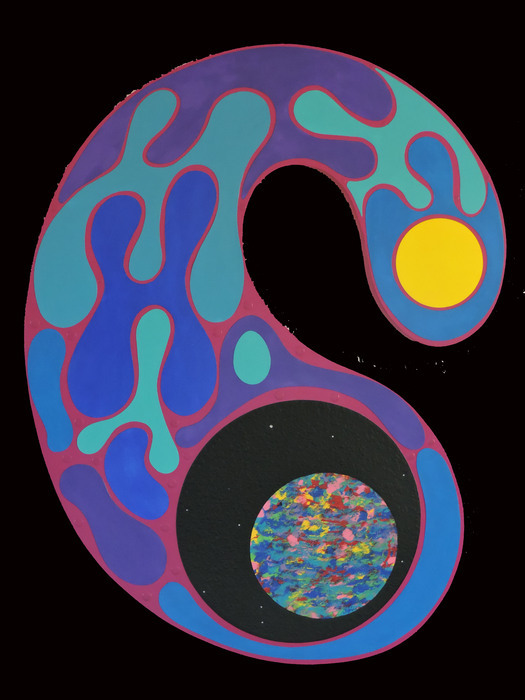 An irregular Multicolored Biomorphic shape, as a frame, that is integral to the artwork, with a recessed canvas backing painted in Cobalt Blue, and affixed to the canvas backing are a multitude of solid colored disks, as a Collage, overlaying one another, creating a psychedelic visual effect, and accompanying the colored disks, are round painted on eyeballs, of various sizes placed around the inner perimeter of the artwork. 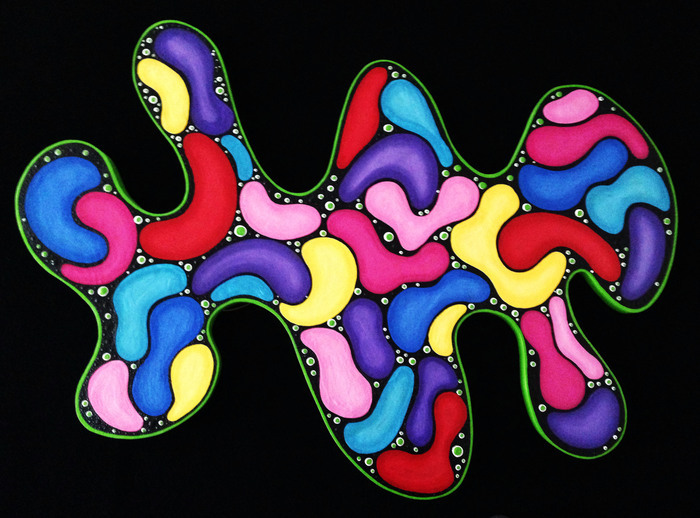 An irregular curvilinear looping biomorphic shaped artwork, that is painted bright lime green around its perimeter, with a forward facing black background, and painted on top of the black background are numerous interlocking bright colorful Biomorphic shapes, that are shaded and highlighted, giving the illusion of depth, and are reminiscent of pieces of colorful candy. The Black background contains black stippling, creating a background texture, and also located between the colorful biomorphic shapes are random white and lime green circular shapes, reminiscent of eyeballs. Description: An irregular curvilinear upside down “J” shaped biomorphic artwork, which is painted bright magenta around its perimeter, and on its main body. The unusual “J” shape represents the folding of time and space. 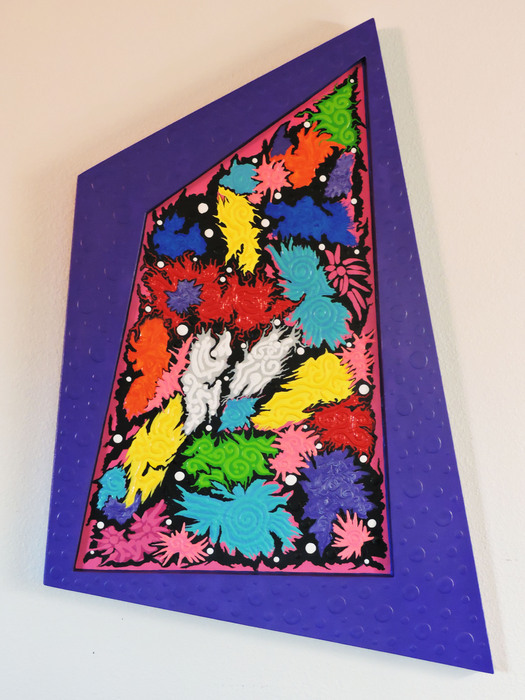 Affixed in the form of a Collage, on top of the bright magenta main body, are various sized “Biomorphic” shapes that are hand painted on heavy paper, in various bright vibrant colors including: Bright Blue, Turquoise Blue, Cobalt Blue, Calypso Blue, Purple, Violet, and Bright Yellow. A Fire Opal colored circular “Planet” is set within a circular satin black area, which is stippled with hundreds of overlapping droplets of satin black paint. Swarovski Crystals, of various sizes are affixed randomly throughout the satin black “Space” area to represent stars. A surrealist depiction of Colorful Striped Female Beings in dancing poses, dancing in the sky, and representing the Aurora Borealis. The background is a flat Cobalt Blue color that has been covered in circles of raised paint creating a textured background. Swarovski Crystals are affixed in a random manor to represent “Stars”. A surrealist depiction of Colorful Striped Alien Female Beings in dancing poses, dancing in space. The background is satin black, and has been covered in overlapping spots of raised paint, creating a textured background. A Bright Full Moon is depicted in the top right corner, and Swarovski Crystals are affixed in a random manor to represent “Stars”. This is a very colorful, bright and vibrant “Abstract Expressionist” painting that employs a “Marbling Effect” which creates the illusion of “Movement and Action”. The different colors of paint do not blend together, but stay separated into hundreds of hair thin lines, of different colors, seemingly flowing next to each other. The perimeter is framed in cobalt blue, and is textured with multiple built up layers of paint droplets, giving the perimeter of the painting texture. 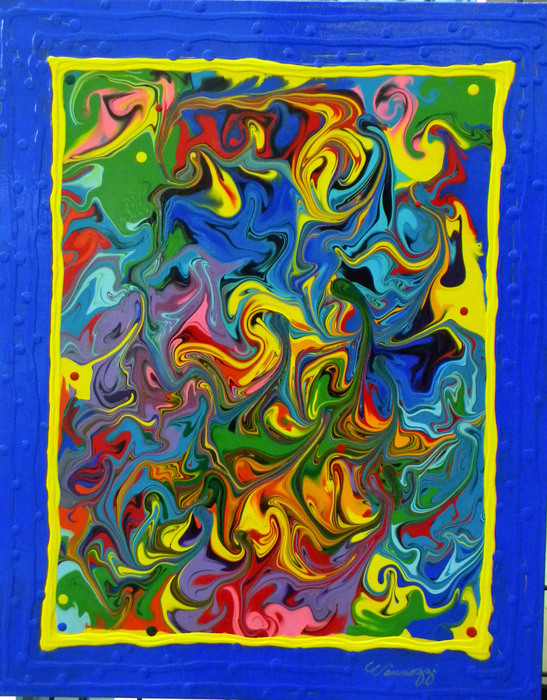 The colors flow in “Vortexes”, going different directions, creating currents and eddies of color and movement. The Painting “If Picasso Painted Mona Lisa” by Vannozzi was an exercise in trying to merge the most famous painting in the world: ”The Mona Lisa” by Leonardo Da Vinci, and paint it in the style of the famous Artist: Pablo Picasso, but the painting still had to be easily recognizable as “The Mona Lisa”. 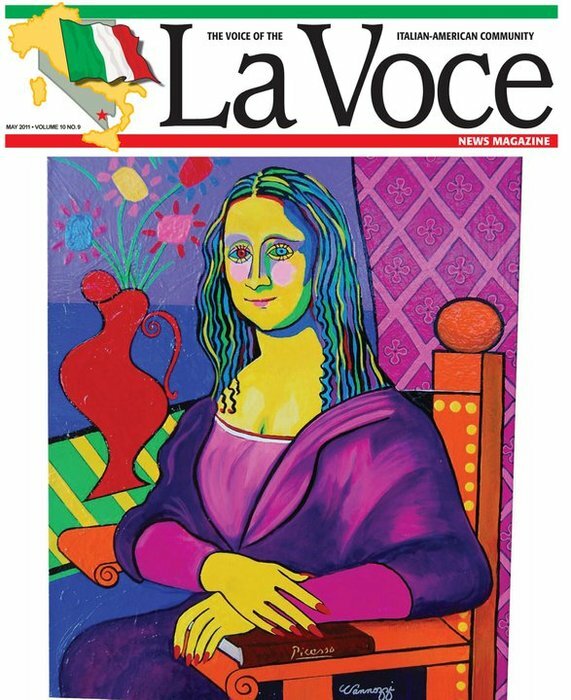 Vannozzi took elements and styles from various Picasso paintings including: Dora Mar – (hair, eyes & skin colors), Hands with Flowers – (Flowers element), Large Still Life with Vase – (Vase element), Woman in Chair- (Chair element), and “The Dream” – (Curtin element), and integrated them into the Mona Lisa painting. Description: While working on his car one day, Vannozzi had the occasion to refer to an “electronic schematic diagram. As he traced a circuit, the Artist looked at the entire diagram, and with his “artistic eye”, and he saw in its color coded complexity, a certain beauty. 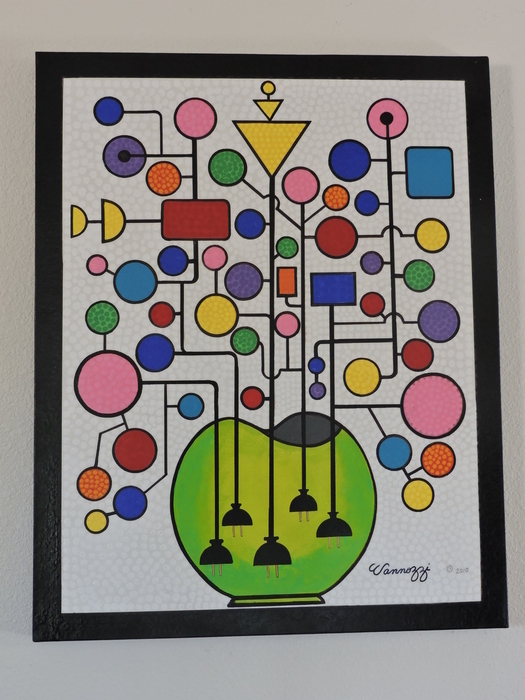 From this, the Artist developed the idea of painting a vase of flowers in the style of a color coded electronic schematic. 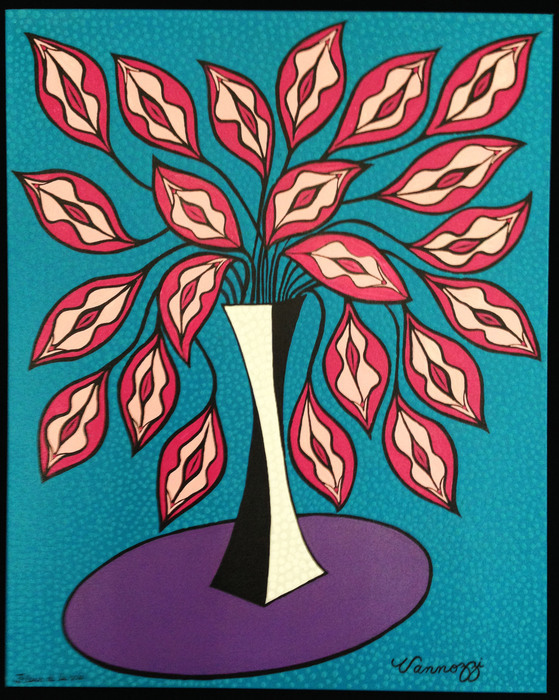 The Artist employed various geometric shapes and colors, in a flat motif, to achieve the representation of a color coded schematic, but in an arrangement representing a vase of flowers. Black electrical plugs are portrayed as the “Roots” of the flowering plant. The background is predominantly white, and the entire painting is executed with paint droplets creating texture. Description: The story goes that one day the artist was innocently rolling up a piece of paper in his hands, while having a conversation with a friend. When he looked down at the rolled up piece of paper, it had attained a slightly conical spiral shape, which reminded Vannozzi of a flower. In true artistic fashion, he decided to sketch out a vase of “rolled up paper flowers”. Being happy with its result, he decided to do a painting, and so Moonlit Shalimar was created. The painting was executed in shiny sterling silver paint on a satin black background. 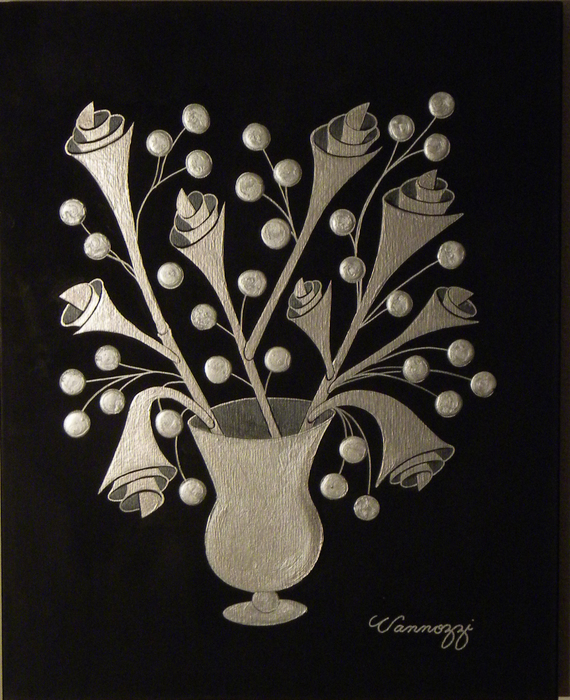 The background is textured with a multitude of built up satin black paint droplets, giving the perimeter around the silver flowers texture.